It is August 2014 and DC Comics invites you to go where even the gods fear to tread. Malibu. RB Silva, Cory Smith, and Scott Lobdell have yet another installment of their heart warming tale of three young friends travelling hither and yon, bringing joy and goodwill to all they meet. Wait. No. That can't be right? Bugger! To QUOTE Starfire (in 'Raven's body' from Teen Titans episode 7): “RIGHTEOUS FURY”. Wasn't it just two issues ago that we were all excited about Scott Lobdell's return and how he quickly reminded us of why Jason, Roy, and Koriand'r call themselves outlaws? (Or, apparently, “The Outlaws” like it's a subsidiary of the Justice League, that Wonder Woman can call into action whenever she needs some folks who don't hesitate over killin' some Nazis?) Yeah. Now we get to find out where they draw the line. It's certainly a fuzzy line. And it's raining, so it's hard to see anyway. Oh, and apparently Trevoral (if that's his name, not his species) is not Bolovaxian. Too many arms. Yup. That's my big takeaway from this issue. Trevoral is not Bolovaxian. What? You were worried about why Kori stormed off Or what Roy, Jason, Kirk and the amazing disappearing-reappearing Ray -- plus their I.T. guy -- were going to do about it? Hahahahaha! Guess you'll need to read this adventure, huh? Damn. This is really an incredible comic. I think it would probably be an awesome read even if you haven't been following it for the last couple of issues. (Those pre-Crisis style narrator boxes I mentioned last month will catch you up). Lobdell's writing is good, but the way Silva and Smith illustrate the emotional story is absolutely immaculate. I'm really taking a liking to RB Silva. There's still a bit of the ol' simplified two-dots-and-a-smile-line faces that I complained about last month, but they blend right in this time. When they abstract the faces it's because your focus is elsewhere. (Mostly on angry stances and clenched fists in this case). And as last month, it's amazing the degree of emotion Silva can express in characters with no pupils. I don't know whose idea it was to set the confrontation on a rainy night, but it worked brilliantly. I want to enlarge and frame most of the panels from that scene. This issue isn't a tearjerker of a read, but it's certainly an emotional rollercoaster for the characters and most of the intensity comes from the art team. Not to knock the script. It's powerful, but my favorite part was actually the one gag of the issue -- the S.H.A.D.E. I.T. guy calling Jason “sir” and Roy calling I.T. guy “dude” in the very next beat. 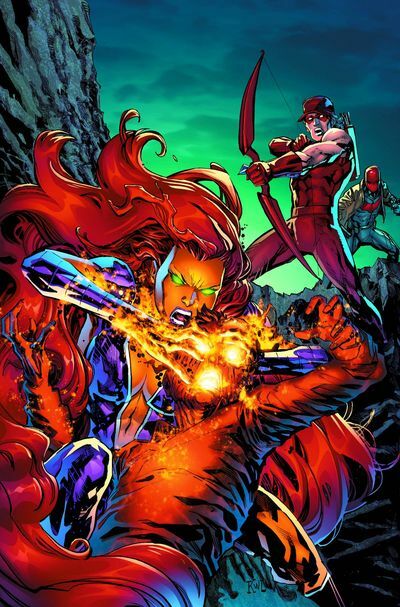 But Kori's unbridled cruelty at Trevoral, absolute yet carefully contained fury when she arrives at her quarry, and pained kopfherztrennen with her well intentioned friends were as pure and true a sentiment as I've seen in any recent comic book. It's as close to “real” as you could possibly get when your character is a formerly enslaved princess from another planet. And if you're curious what “ kopfherztrennen” means, I had to make up a German word for “head heart disconnect” because the English language just wasn't working for me. Okay? At least I don't write comics with villains named “Doctor Forger” (see Batman Eternal) or “Never” (see Justice League United) in other languages. So back off. I totally missed it last month, but when Kori stormed off she was in the Ant Farm. A place you can't just bust out of (well, Kori probably could, but she'd be microscopic) without going through the resizing gateway. So, yeah. Not sure how that worked. And Ray Palmer's back as well. 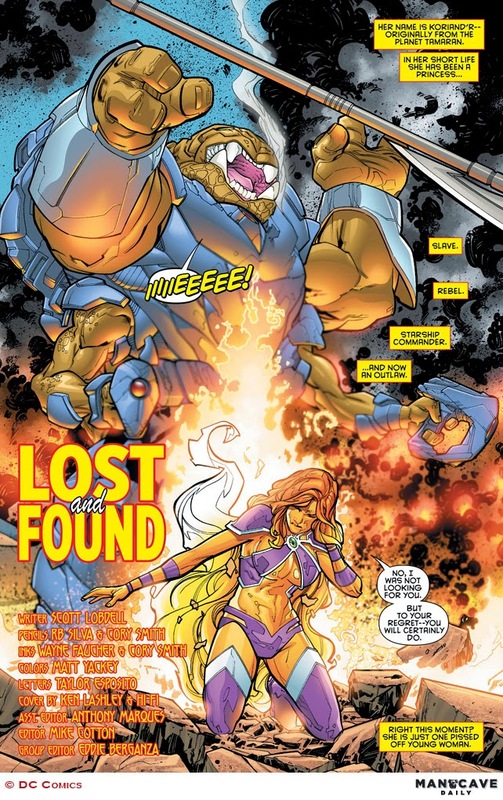 Plus no explanation as to where he went when Kori stormed off. While I've apparently become a Silva-Smith fanboy this week, there are a few moments that missed the mark. There's only two shots of Jason without his helmet, and the second of them just looks really off -- he's got this Rock eyebrow going on over big blue anime eyes. There's a panel of Koriand'r floating outside her target's window with circles all over her abs -- I think they're supposed to be water rings on the windowpane, but it looks like she's got a bunch of Mickey Mouse tattoos in progress. In the last scene where we see Jay and Roy someone left the bat symbol off Jason's chest when drawing/inking in the uh, stuff that got on him. Then there's one of my pet peeves -- when showing a real world place on a map that resembles the real world, said place should be where it is in the real world. Must be that in the DC Universe there's a Malibu, Florida, near Apalachicola. I wish the flashbacks were given a bit of color or some semblance of detail -- as they get sort of muddy in the bluescale. But there's one flashback frame, where the slaver (have we learned his name?) is getting in to his future wife's pickup, and they're both looking off at something else. What are they looking at? This issue really didn't end in a way that implies we'll ever circle back to find out. The theme for this issue's song was an easy one to pick -- Kori's quest for vengeance is the story -- but exactly which one to choose was tough. Warrant's “I Saw Red,” Loretta Lynn's “Fist City,” Taylor Swift's “Better Than Revenge,” Pantera's “F*cking Hostile,” Judas Priest's “Screaming for Vengeance,” and Danny Byrd's “Red Mist” were all contenders, but most of them are about relationship revenge and none quite had the right tone. So the theme song prize for this issue goes to Alice Cooper for “Vengeance Is Mine” -- despite the fact that he apparently only wanted vengeance on the receptionist. Bonus: the guy in the Jack-O-Lantern mask works as a proxy Red Hood. This is certainly a complicated issue. And no matter what I compare it to it's going to fall short. 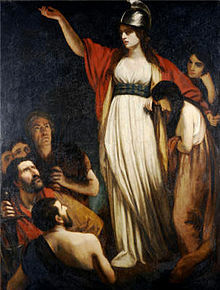 But in part, at least, it certainly feels like Boudicca's revolt against the Romans. While Tamaran and the Iceni's tribal lands may not be perfect parallels, Kori's rage could certainly burn down Camulodunum, Londinium, and Verulamium even without a hundred thousand angry Celts behind her. The only thing better than the emotional roller coaster this issue takes us on is where it leaves us. (Especially if you've read November solicits about what's up with Jaybird's future). Those last two pages don't say a single word, but speak volumes about where this series is headed. Assuming we're seeing what I think we're seeing. Initially, I was really bent out of shape about how we recently reestablished Jay, Roy, and Kori as killers and anti-heroes but now they're suddenly concerned about what killing the man who enslaved her for years would do to Kori's psyche. It seemed like such inconsistency of character, especially with Jason's history with the Joker. (Doubly so if Under the Red Hood (Batman 635-650) is considered New 52 canon). But after a second reading I shifted to side with the story. The Outlaws draw their own lines about right and wrong and when vengeance is good and when it isn't. This story is about Roy and Jay having a different line than Kori -- or at least different than where she thinks her line is in the midsts of fury. She tells them she'll do as they ask, but they don't ask, because they know she needs to make up her own mind. And that speaks volumes more about the trio's relationship than a killing spree would. Of course, now I'm all bent out of shape at “Batman and Robin” and “Batman Eternal” and all the other recent stories where Batman is suddenly just playing don't-ask-don't-tell with Jason. Red Hood is a full-on member of the Bat-family despite being more than willing to kill, just so long as he doesn't do it in front of Batman? Ha! Lobdell is actually building up the Outlaws to be far more moral characters than Batman, the master of violating trust in those closest to him. Kudos, Scott. I really hope that the S.H.A.D.E. I.T. guy gets a name and a recurring role across other titles. He could be Agent Kincaid's Oracle or some such.